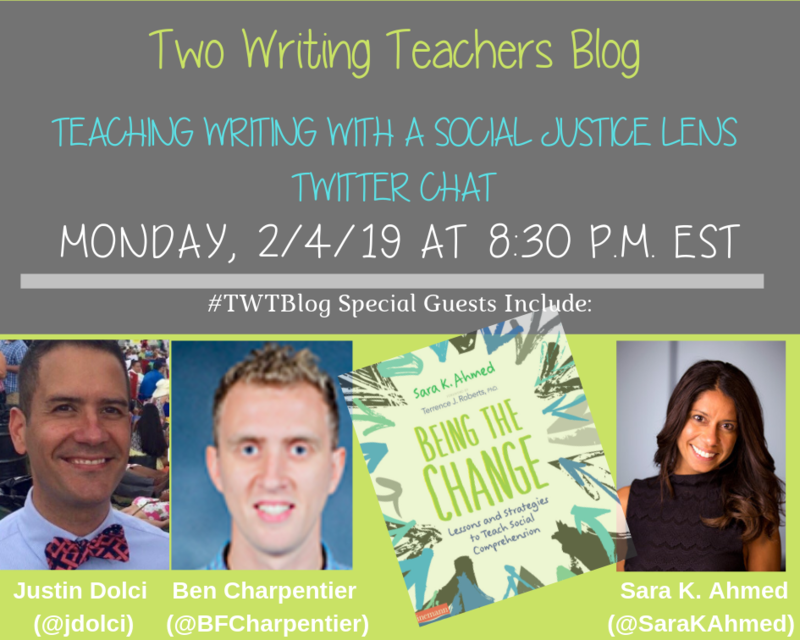 Teaching with a social justice lens means you look for every opportunity to let your curriculum be the springboard to know what it means to be a person of character in this world. How will you act when no one is looking? What will you say and do to improve your home, your neighborhood, your country, your world? How will you use what you are learning in school to think more deeply and critically about all you encounter and envision ways to make things better? How can you use writing to stand up for what is important? In the early days of the new school year, I am given my curriculum calendar, which details all the units of study I will be teaching in each subject area. Glancing at my curriculum calendar, I notice that my third graders are scheduled to learn about persuasive speech writing in the spring. Persuasive speech writing is a powerful way to show students their voices matter, to use the mandated curriculum as that springboard for thinking critically. But before my students begin to write speeches, there is work to be done. In my classroom, we begin the year with students sharing an “autobiography bag” of objects that describe their culture, interests, and family life. As students take turns sharing, I jot notes about each child. I use these notes to help me build relationships with my students. Students see that I care about them and I’m invested in helping them learn. Another way to help students feel accepted and part of the community is through the “Thoughtful Third Grader” activities. Each week, one student is selected to be the Thoughtful Third Grader. He/she is interviewed and the class writes “warm fuzzy” compliments for the student. These are put together into a book the student brings home. The student selects a book of his/her choosing for me to read to the class as well. These activities emphasize our classroom as a community of readers and writers and the student in the spotlight is able to pick a book that reflects his/her interests, passions, and identity. 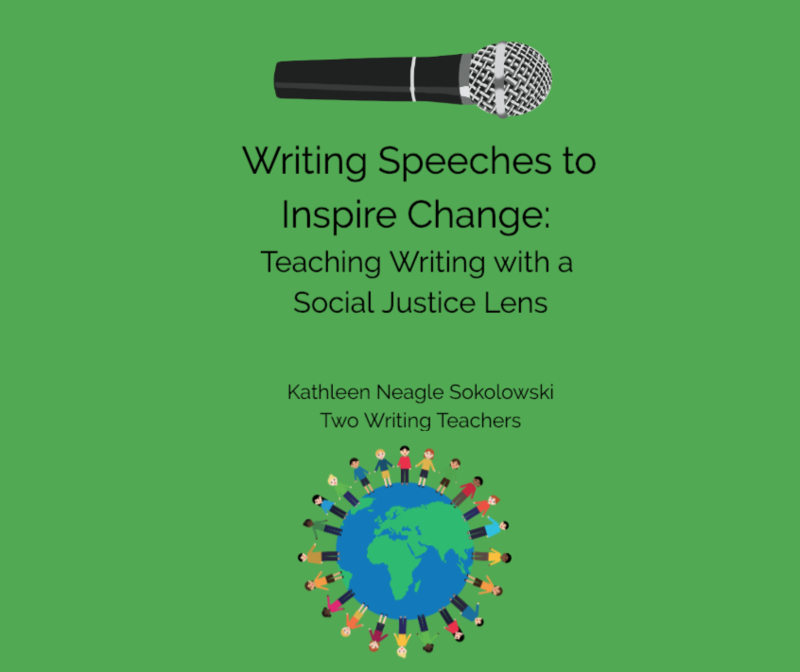 One of the most powerful ways to prepare students to write persuasive speeches is to read aloud texts that expand their world view, touch their heart and make them see how regular people have helped to change the world. Books and poems can be shared throughout the year and the teacher can help facilitate discussion about equity, courage and hope. Some of my favorite books that can spark rich discussions can be found in the slideshow below. This week, Stacey and Betsy also shared examples of mentor texts that can be used when teaching writing with a social justice lens. It’s fortunate social issue book clubs is a unit I teach in reading that comes right before persuasive speech writing. Students study social issues like bullying and being a bystander, poverty, inequality, and family issues. Many of the books, songs, and poems students read open their eyes to social issues they weren’t aware of before. Other students who have faced poverty, family issues, or feeling different find the texts from the book clubs to be mirrors and can spark honest conversations about these weighty topics. Georgia Heard’s brilliant book, Heart Maps, offers many types of heart maps students could create for different purposes. One of her maps is a “Be the Change You Wish To See in the World Heart Map.” As the persuasive speech unit draws closer, students can use this map to sketch out the things that worry them at home, school or in the community. They can think about what seems unfair or what might be done to help people in some way. Kid President and “LivBits” (Olivia Van Ledtje) create videos that are inspiring and sometimes tackle issues like equity and poverty. Sharing these videos with students can help them see that kids can take a stand when something bothers them or is upsetting. The videos also show that a speech is your writing brought to life and can model for students how to bring enthusiasm and passion in your delivery. After all year of facilitating discussions and reading texts that focus on equality and justice, it can be disappointing when students select topics like “We should play Fortnite at school” for their persuasive speech.However, students need to write about what they care about. Sometimes what they care about does not match what we wish they would write about. However, making students select a topic we think is worthy but is not their choice will not serve them well as writers. I’ve had students write speeches to their families requesting a new pet or to take a family vacation. These were the issues that mattered most to them at the time. Students have written speeches about wanting more freedom at lunch to sit with different children from other classes and to have longer recess. As much as possible, help students find an issue they connect with deeply. When students begin to craft their persuasive speeches, make sure they know someone will listen to them! When you teach writing with a social justice lens, writing should not live on a page inside a notebook or folder. A speech, especially, needs to be read aloud and shared with the people who are trying to be persuaded! If possible, record students’ speeches and have them share them with family members, school administrators, or a relevant person to the topic of the speech. Make sure the speech gets out into the world and the student believes the writing can make a difference. As a third-grade teacher, I understand how overwhelming teaching can be at times. There are times I’ve felt I’ve lost my way. My North Star, what brings me back to why I became a teacher, is what Dr. Martin Luther King Jr. said: “Intelligence plus character- that is the goal of true education.” I became a teacher to do my part to make the world a better place. This means I can help each student see his/her value and worth, while also helping them to affirm and understand the value and worth of others. When you know you matter and you believe others do too, you cannot accept a world where people are discriminated against, for any reason. You challenge the unfair and unjust policies and laws in your community and beyond. You know your voice matters and you use writing to inspire and see change. 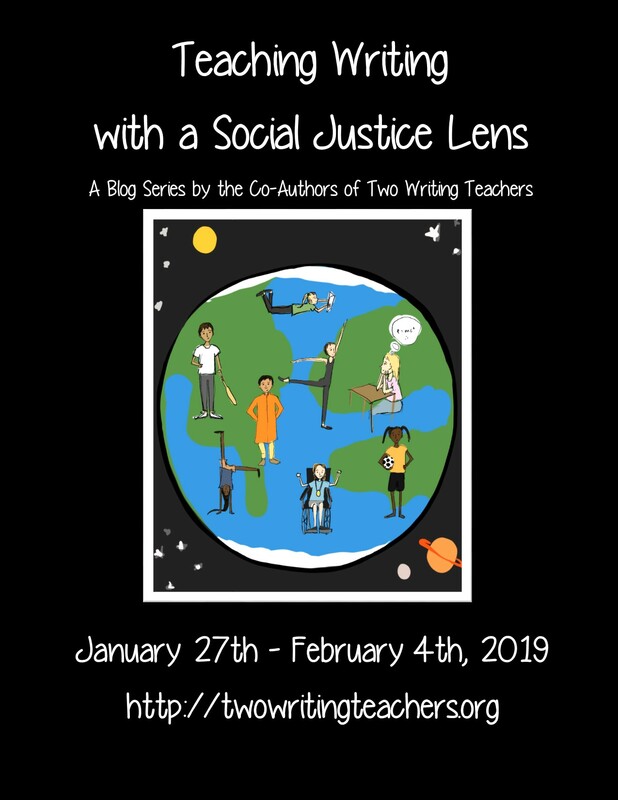 How do you find ways to teach writing with a social justice lens? I want to support the students at our school to take their writing globally. I would love to hear/read your ideas through the use of purposeful driven technology. Kathleen, I just love this post, thank you! I’ve been thinking a lot about this – especially after seeing Cornelius Minor and reading Being the Change. Excited to try out social issues bookclubs! Just this week we created a new unit on social issues speeches for our 5th grade Argument/Opinion unit. Perfect timing! Thanks for sharing your insights and always writing from the heart. I would love to get an opportunity to receive your book. Thank you for this post! It’s a good reminder of giving our students the opportunity to use their voice to impact change or inform audiences! So many valuable ideas, suggestions, and ways to look at all the opportunities we have to help students see their voices in a public way! Love all of this. You are always so thoughtful about the way you do things, Kathleen. I love the way you’re encouraging students to use their voices! What I love about this post and the resources in it, is that they can be used at any grade level. It is always the right time to develop character in our students. 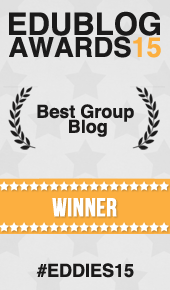 Each morning these blog posts fill me with inspiration. I am in the midst of my persuasive unit and look forward to using the Georgia Heard Heart Map book for the students’ next speech. I will also implement the idea of sending a recording of speeches to people who may by persuaded to implement the change. Thank you! I love your thinking about how to make the persuasive speech writing unit of study feel relevant and important to third graders Kathleen. I also love the link to the Thoughtful Third Graders post which I somehow missed. Thanks! Off to share this with our third grade team. “Making students select a topic we think is worthy but is not their choice will not serve them well as writers.” Students can’t know the power of their own voices until they’re writing about something that really matters to them. This is what catapults writing from a compliant chore to a labor of love and belief. Students need to know the classroom is a safe place for sharing their ideas and respecting those of others. Such a mutually supportive, nurturing atmosphere you establish for your students, Kathleen. How you honor your young writers and their voices! Kathleen, your writing always inspires me and my teaching. You relate to the realities of being a teacher working in often challenging school environments, yet you always focus on what’s most important, the children we teach.